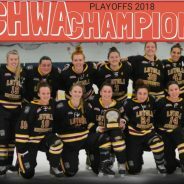 KALAMAZOO, MI – The 2018 Central Collegiate Women’s Hockey Association held their annual tournament this past weekend at Wings West Arena, where the Loyola University-Chicago Ramblers recorded their first CCWHA Tournament win after defeating University of Notre Dame in the championship. Friday, February 23, had the first game of the playoffs set for Loyola University against Adrian College. The Ramblers grabbed the first lead of the game with a goal from Reagan Lynn, unassisted, late in the first period. After a second period of no goals, the 2017-18 regular season champions tied things up with a goal from Hannah Chase at 5:16 into the third. Katie Hayward credited with the assist. The Ramblers regained their lead after a Ryley Coleman goal just four minutes later, and Chloe Zinter would secure the 3-1 win with Loyola’s third goal with less than two minutes left in the game. Zinter’s powerplay goal was assisted by Caitlin Earley and Coleman. In net for Loyola was Julia Smith who made 33 saves on 34 shots on net, while Victoria Poland stopped 31 of 34 for Adrian College. Friday night’s second pool play game had University of Notre Dame and Northern Michigan University facing off. The Wildcats would hold the lead after one period with an Eve Feldman goal at the 8:39 mark. Kendall Turro with the helper on the first goal of the game. Less than a minute into the second period is when the Irish tied things up as Kiera Dwyer found open net after a pass from Gretta Steigauf. Notre Dame kept the ball rolling as they gained another goal at 3:42 into the second period, this time the goal came from Erica Steiguaf. Dwyer and G. Steigauf with the assists on the go-ahead goal. Caitlyn Muehlbacher of Northern Michigan tied things back up midway through the second, unassisted. However, Maura White found her first goal of the weekend, also unassisted, with a second left in the second to make it 3-2. Holding a one goal lead for most of the third period, with two minutes remaining Dwyer soared on past the Wildcat goaltender for a 4-2 finish. Caroline Riester was in net for Notre Dame, stopping 35 of 37 shots faced and Sydney Higgins was between the pipes for Northern Michigan making 35 saves on 39 shots faced. Saturdays’ first of four games began with Loyola University-Chicago versus University of Notre Dame, with the Irish emerging victorious, 4-3. Whitney Knight grabbed the game’s first goal from the point to give the Ramblers a 1-0 lead at 7:31 into the first period. To add to the lead, Sophie Riedel put another goal in for Loyola halfway through the first after a pass from Michelle Cottrell. Notre Dame’s Gretta Steigauf began the Irish comeback as she found her first goal of the tournament with an assist from Katie Sylvester. ND’s Kiera Dwyer made it a tie game seconds after the Steigauf goal. Noelle Rosa and Colleen Dosch registered the assists on the Dwyer goal. Erica Steigauf grabbed her second goal of the weekend to gain the Notre Dame lead, 3-2, at 5:15 in the second period. Dwyer and and Maura White had the assists on the E. Steigauf goal while on the powerplay. Steigauf found the back of the net once more in the second period, a minute after her first of the game. Olivia Fossier of Loyola put in the Rambler’s third goal, making it a one goal game at 11:13 in the second period, with an assist from Knight. Emily Wissemes would hold off any more goals from the Irish as she stopped the remaining shots in the second and all of the third period for a total of 31 saves on 35 shots faced for Loyola for the win. Sam Ayala stopped 23 of 26 shots for Notre Dame. Up next was Northern Michigan University and Adrian College in both of their second games of the weekend. The Bulldogs started things off in a high scoring game, with Cristina Rotondo grabbing a goal at the 4:25 mark in period one. Elizabeth Anderson and Erika Gilbert would be named on the assists tally. Rotondo would grab a second goal for Adrian just a minute later, this time assists from Hannah Chase and Anderson. After a 2-0 lead was held for six minutes by Adrian, Caitlyn Muehlbacher broke the Northern Michigan silence with her second of the weekend. Mary Schimmel would grab the assist. Three more goals would be put in before the end of the period, first by Maria Granger of Adrian College to make it 3-1, second from Anderson at 18:39, and with a minute left in the first Kelsey Weyland of NMU would find the back of the net after a shot from the blue line, 3-2. Chase with the assist on the Granger goal, Gilbert with the assist tally on the Anderson goal, and Kendall Turro with the Wildcat assist on the Weyland goal. At the 3:46 mark in the second, Turro sent her first goal of the tournament into the back of the net, unassisted to tie the game at three. Two minutes later and another Bulldog response, this time from Chase to make it a two goal lead. Elle Van Antwerp with the assist on Adrian’s fifth goal. Turro would do it again, as she fired another shot past the Bulldog goaltender to make it 5-4 with twelve to play in the second period. Vanessa Hiley credited with the assist on Turro’s second goal. Also grabbing her second goal of the game was Granger, as she found open net at 13:09 into the second after passes from Chase and Mackenzi Heisner for a now 6-4 game. Northern would continue their call-and-answer trend with a goal from Anna Cockey to bring it back to a one goal game, 6-5 with less than a minute left in the second period. Scoreless through all but one minute of the third, when the Wildcats pulled their goaltender for an extra attacker with a minute to go. At 19:10 into the third period, Chase would find the first empty net goal, and with three seconds remaining in the game, Gilbert would put in the second empty-netter to make the final 8-5. Sydney Higgins was in net for Northern Michigan making 27 saves on 33 shots on goal, while Victoria Poland made 40 saves on 45 shots for the win for Adrian. The first afternoon pool play game was set for Loyola University-Chicago against Northern Michigan University. Caitlin Earley got things started for Loyola with a goal, but not before a whole scoreless first period. Earley’s goal came at 43 seconds into the second with help from Chloe Zinter while on the power play. Caitlyn Muehlbacher made it 1-1 at 7:03 with a Northern Michigan goal. Also on the powerplay, Schimmel would get the tally for the assist on the only Wildcat goal of the game. Michelle Cottrell found the game-winning-goal at 13:18 in the second after a pass from Earley, 2-1. Maureen O’Brien added to the score with 30 seconds left in the second to give the Ramblers the two goal lead heading into the final period of play. Julia Smith would hold off any Northern Michigan scoring attempts as she picked up the win for Loyola with 10 saves on 11 shots on goal. Sydney Higgins made 16 saves on 18 shots faced for Northern. The Ramblers would advance to Sunday’s championship game. The final pool play game of the tournament saw University of Notre Dame and Adrian College fighting for a chance to move on to the championship game on Sunday. Erica Steigauf put Notre Dame ahead with the only first period tally. Katie Sylvester with the pass for the Irish goal at 5:27 into the first period. However, Katie Hayward fought back less than a minute into the second period of play with an Adrian goal with a pass from Hannah Chase. Another Irish goal, this time Gretta Steigauf would be the scorer. Noelle Rosa with the assist for the ND power play goal at 8:43 in the second period. Erika Gilbert found herself a goal at 16:34 in the second for a tie game. Kiera Dwyer gave Notre Dame the lead once more with less than a minute to play in the second with assists from E. Steigauf and G. Steigauf. A 3-2 game with one period of play left, tensions were high. No goals were found for most of the third period until late into play Dwyer would find herself on a breakaway attempt and would succeed to make it 4-2, Notre Dame. Caroline Riester was in net for the win for the Irish making 37 saves on 39 shots, while Victoria Poland made 36 saves on 40 shots between the pipes for Adrian. The Irish would move on to the championship game. Sunday’s 2018 CCWHA Division 2 championship game had Loyola University-Chicago and Notre Dame vying for the title. A scoreless first period before Maureen O’Brien broke the ice in the second at the 10:22 mark. Michelle Cottrell would grab the assist on the first Rambler goal. O’Brien would tally her second goal of the game five minutes later after a pass from Reagan Lynn to give Loyola a 2-0 lead after two periods. 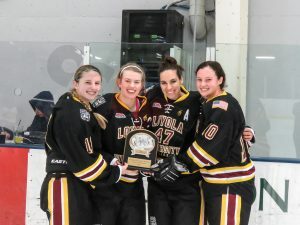 The Irish fought back and found a goal at 3:39 into the third period, but Julia Smith would hold onto the 2-1 Rambler lead in net making 30 saves during the game on 31 shot attempts to help Loyola win their first CCWHA Playoff title. Caroline Riester made 22 saves on 24 shots in net for Notre Dame. The 2018 Tournament MVP was awarded to Julia Smith of Loyola University-Chicago as she made a total of 73 saves on 76 shots in three games played over the weekend. The Ramblers earn an autobid by winning the CCWHA Playoffs and will head to the ACHA Division 2 National Tournament in Columbus, OH in March.